The Empire State Carousel is a carnival ride, an ongoing work of American folk art, a timeline of New York State history, and an expression of the state’s diversity. 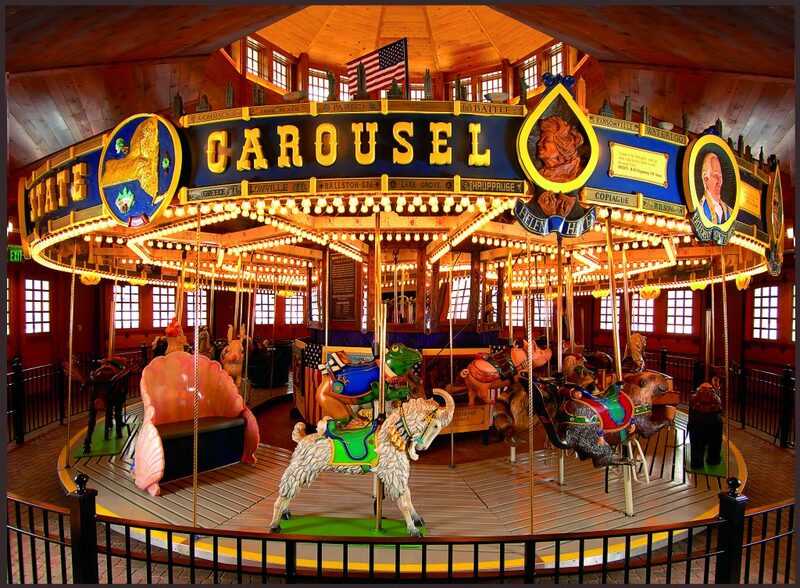 First conceived in 1983 by head carver Gerry Holzman and guided to completion by him, the carousel and its hand-crafted band organ were donated to The Farmers’ Museum by the Empire State Carousel Association. Featuring original contributions by over 1,000 New York volunteer artisans and artists, it opened on Memorial Day 2006. The Empire State Carousel is housed in a twelve-sided building built specifically for the carousel. The Empire State Carousel is a beautiful example of a traditional country fair ride. Called “a museum you can ride on,” it has 25 hand-carved animals representing the agricultural and natural resources found in New York State. In addition to the beautiful hand-painted animals are a scallop shell (the state shellfish), an Erie Canal boat, and an original lover’s tub. Folklore panels and other carved elements depict Uncle Sam and Deerslayer. Portrait panels of such notable figures as Susan B. Anthony, Teddy Roosevelt, Grandma Moses, and Jackie Robinson enhance the rounding boards. Eight-foot curved murals depict moments in New York State history, from the arrival of the Half Moon to the construction of Levittown. The hand-carved frames around the mirrors showcase eleven different regions of New York and carved place-names highlight towns all over the state. Even the sweeps of the carousel feature over 300 feet of hand stenciled state symbols: the bluebird, rose, apple, sugar maple leaf, and state map! 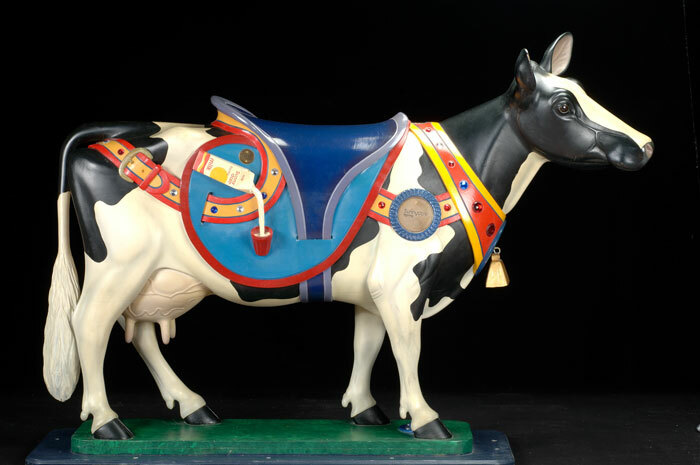 The Farmers' MuseumEmpire State Carousel is a beautiful example of folk art... and you can ride on it! Charlotte Chicken represents the Leghorn breed, which is prized for its prolific egg laying. Carved by Gerry Holtzman and painted by Jill Irving, she represents the poultry farms of New York on the Empire State Carousel. Clarissa Cow is modeled after a Holstein-Friesian, the most popular dairy breed in New York State. She has traveled all over New York State to promote good nutrition, agriculture, and the Empire State Carousel. She was hand carved by Bruno Speiser and painted by Jill Irving and now is a part of the Empire State Carousel.